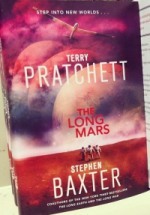 Terry Pratchett's final novel has been published, but I'm still a couple of books behind, including the series he co-wrote with Stephen Baxter. To be honest I've never felt that Pratchett had a huge amount of input into the actual writing of the Long Earth novels - I know the idea of parallel worlds that could easily be visited was his, so that could be the only reason his name remains on the books. It makes sense that with Pratchett's failing health while the series was being written, Baxter would do most of the heavy lifting, and there's never been much hint of Pratchett's style in them - either in terms of humour or of story. Instead the books seem primarily concerned with creating a universe based on the initial conceit, rather than having particularly involved stories take place in it. So as the name suggests, the third book The Long Mars expands that further to include a trip across the various versions of Mars. But these don't run parallel to the Long Earth, instead stretching out into yet another different series of alternate universes. As usual there's also various storylines going on across the Earths as well, including the rise of a possible new evolution of humans. With the series nearly over I might as well continue to the end (although I guess Baxter could keep going on his own, in which case I'll bail out) but this sweeping look across the whole of a new universe doesn't really leave much room for the kind of story development I was hoping for.